It's Scrappy Saturday over at Angela's blog, So Scrappy. This month she's chosen blue scraps for us to work with so I pulled just some of my blue scraps and made some more of these 3 1/2 (unfinished) string blocks. I'm not sure what I will do with these blocks, but a couple of years ago I made these other color blocks as part of the Rainbow Scrap Challenge. I also made these blue Dresden blades out of some of my 2 1/2" strips. You can find my tutorial on how I cut these Dresden blades and how I use them to make a table topper here. I've been making a few string blocks from my scrap bags, too. I had forgotten how much I like piecing strings. You can find my string block tutorial here. There is also a tab under my blog header. Here are just some of my scraps. I have a drawer full of 2 1/2" strips, and some 2" strips and a lot of 1 1/2" strips besides the bags in the photo below. You can see that there are a lot of scrap projects in my future. The big snow storm went south and east of me. I hope all of you that are in the storm are safe and warm. I'm linking up with Angela's Scrap Happy Saturday. Click on over to see the rest of the blue projects for this week. I've been tidying my sewing room, folding and refolding fabric, and taking stock of the things that I started in 2015 and before. I've been working on some of those projects, especially the ones that have a lot of pieces. Somehow, I think that if I can get things sewn into one piece then it won't look like I've got so much started. Sometime I'll show you a photo of my UFO tops that need to be quilted. This is the center of my Brinton Hall quilt. The pattern was published in two parts in Quiltmania Magazine #107 and #108. I started the center back in July of last year, and over the weekend I finished sewing the corner scrappy hexagons onto the center. You can see close up photos of my center blocks here. 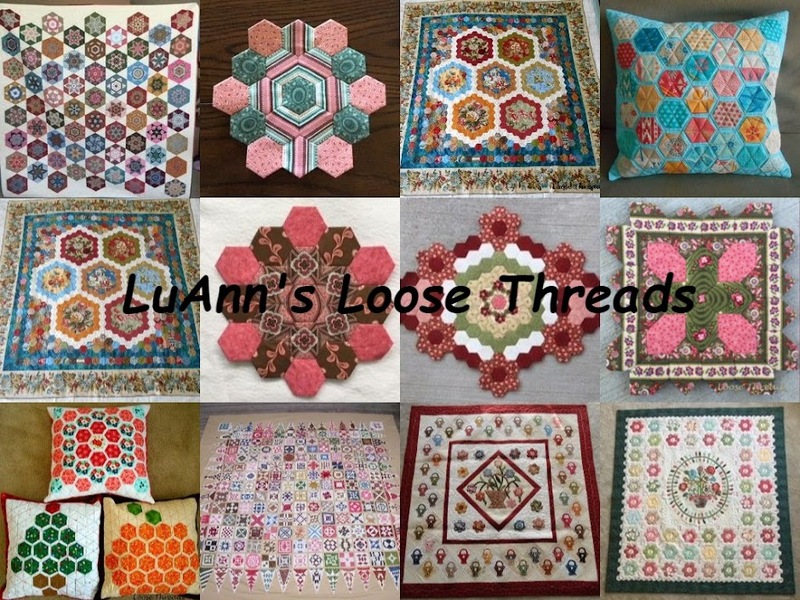 You can see how I made the template to do each of the center hexagons in my post here. I could see an entire quilt made of just the fussy cut fabrics framed by a hexagon ring and then separated by a path. After the center above is sewn onto a background fabric, there is a border of hexagons around the outside. I have 3 of those strips sewn and have the last side basted and ready to sew. I've also been sewing some scrappy hexagons together. Again, I'm trying to have less pieces. Here are the 1" hexagons that I have basted. You can see that I have a lot more cut in the bottom left corner of the case. There are enough of some of these that I could make a few flowers. This case is from JoAnn Fabrics and is nice to just grab and take along to a sewing get together. I keep extra hexagon paper pieces, my hexagon template, thread, needles, glue stick, and a small pair of scissors in the case so it's always ready to go. I've also been working on my Bonnie Hunter mystery quilt, Allietare, from last November/December. I have all of the parts sewn together and just need to sew them into blocks. Here are a couple that I've done so far. I love the rusty reds and golds in this quilt. There's lots of piecing in Bonnie's quilts, but they are well worth it in the end. I love all of her quilts. It's supposed to snow tonight and tomorrow, so I plan to spend the day at my sewing machine. The holidays flew by way too quickly, and I find myself wondering where the time went. For a change this year, I wasn't up late on Christmas Eve wrapping gifts. I have been known to have to finish wrapping after coming home from midnight Christmas Eve service. This year I was done with most everything a week ahead of time so that I could relax and enjoy. I also made this tiny scarf inside of a glass ornament at one of the Saturday Make and Take get togethers. One evening all of the family piled into Grandpa's Highlander, and we went to Garfield Park to see the model train exhibit. Then we stopped for dinner and drove around different neighborhoods to look at Christmas lights. My daughter-in-law made delicious peanut butter kiss cookies and brought candy for the ride. We also made a Starbucks stop on the way. For Christmas dinner, I decided to do something different. This is sweet and sour chicken. I was going to make rice with it, but there was so much food that we all decided to pass on the rice. We also had carrot souffle'. I used Paula Deen's recipe, so there was a nice amount of butter. It is becoming one of our family's favorites. My daughter made Southern Banana Pudding this year. I've put the recipe in the Recipe pages under my header. The little pudding is for Daniel. I finished the little quilt this year, and that is a knitting needle Christmas tree. You can see how I made it here. I'm still working on taking the decorations down and putting them away for another year. I still have the family room tree to pack away. This tree is still sitting in the entryway. I always hate to see the decorations come down. This is about 1/4 of the Yes, Kevin I Can Do Scrappy Mystery. This is going to be a pretty large quilt when it's put together. And, my Allietare mystery quilt by Bonnie Hunter is in a lot of pieces. The mystery has been revealed, and I just love the quilt so I'll keep working on it until I at least have a finished top. I've been taking stock of the things in my quilt room. I've sorted through my strips and scraps. I kind of want to make some string blocks, but don't really have an idea for them yet. And I'm wondering why in the world anyone would need so many charm packs. This isn't all of them. I've found a few more stuck in baggies of projects. I think I'm going to work on using some of these soon, too. Thanks for reading my blog and leaving such nice comments. I hope that you have a healthy, happy New Year. This was a cross stitch I did years ago. I bought a frame for it this year so I could get it out of the moving box.